Yep. The big ‘ole turkey is coming my way. And it’s a good thing, too, because my plate is empty. I’m waiting for….. my TURKEY MADE OUT OF GREEN BEANS! This entry was posted in The Scottie Chronicles and tagged dogs, Scotties, Thanksgiving, turkey day. Bookmark the permalink. Yep…your right…we been seeing activity here since Sunday…..and we noticed the Great Turkey being moved from the Freezer to the Fridge….the scent of fresh meat is beginning to waffle through the air! a green bean turkey ? He’s having a bean turkey. No, seriously, He’s a has bean. You eat off of the good China? We are jealous. Gobble on, my brother, gobble on! You are waiting so patiently! 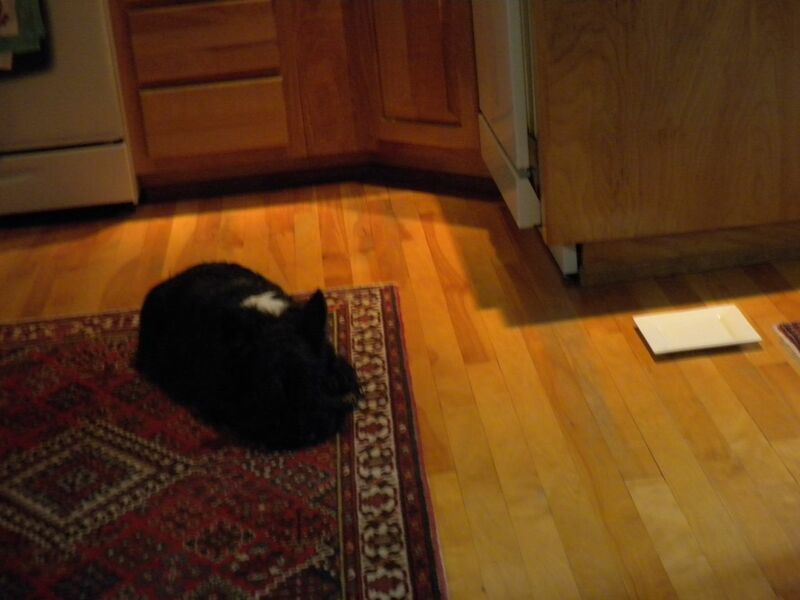 Not us….we are following HER around each time SHE goes into the kitchen, underfoot. We have a guest also, a big chocolate lab named Marlee who is our cousin.We have to be sure Marlee does not get our share of the goodies. We will share, but we have our limits you know. Gobble Gobble! We can’t wait for some turkey here and the Girls can’t wait for their turkey and green beans either Stuart! We are green bean GREEN with envy … we need to start celebrating Thanksgiving in South Africa. Yes. You. Do. Just eat some turkey tomorrow and say you did! A bean turkey? Sounds very guinea piggy friendly! Maybe I’ll just skip the turbeankey and have the cocktail! Cheers! I do exaggerate my friend. I think I can smell it from here…..Snorts! Turkey out of vegetables? That’s just rong.